Yes, you read right. 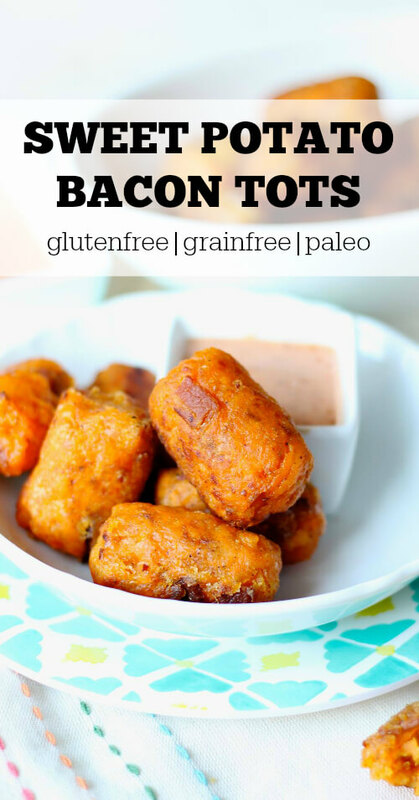 Sweet Potato Bacon Tots. And they are amazing. I know because I ate almost an entire batch yesterday. True story! 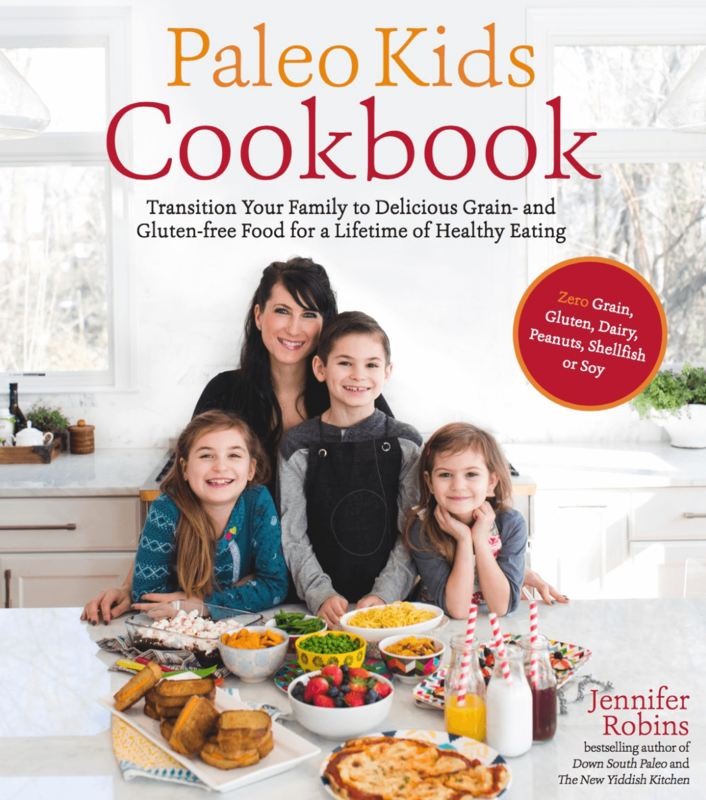 I am so excited to be sharing a new cookbook with you guys today: The Paleo Kids Cookbook by my friend Jennifer Robins. Jennifer is the author of the popular blog, Predominately Paleo and several other cookbooks and has hit it out of the park with her newest book. Not only are the recipes all incredibly creative and completely delicious sounding, but they’re all geared towards family-friendly eating. It’s the perfect cookbook to get your hands on if you are transitioning your family to a gluten free and grain free lifestyle. Jennifer is a super mom who creates tasty, kid-approved recipes with ZERO grain, gluten, dairy, peanuts, shellfish, or soy. Food sensitivities? No problem! 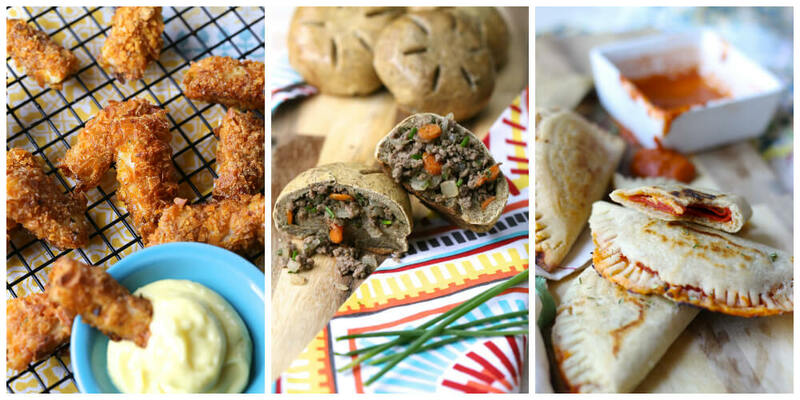 I’ve had The Paleo Kids Cookbook for a couple of weeks now and have made several of the recipes for my family. 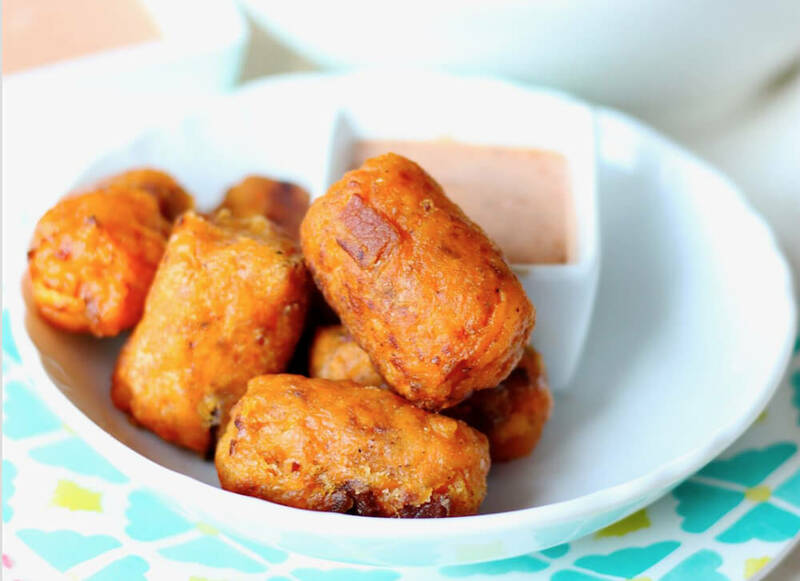 So far, our family favs are the Legit Sandwich Bread, the Glazed Grain Free Meatloaf with Crispy Onion Topping, and of course, these Sweet Potato Bacon Tots. I can honestly say, if you have little people in your home, you are going to LOVE this cookbook! My goal is to bridge the gap between what kids love and what we love to feed them. When it came time to choose which recipe to share with you all, it wasn’t easy. For real, y’all. Everything looks so amazing. My Little One and I spent quite a bit of time drooling over the beautiful and mouth-watering photos. 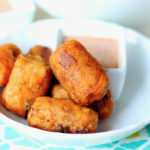 But we finally settled on the Sweet Potato Bacon Tots. I mean, you can’t really go wrong with that combo. Hope you enjoy and be sure to check out Jennifer’s new book. You find it see it HERE. Boil the sweet potato submerged in water for about 10 minutes. Remove the sweet potato from the boiling water and once cool enough to handle, peel or slice the skin off. Grate the potato using a hand grater, mandolin or food processor. Once the sweet potato is grated, use a hand towel or a few paper towels to squeeze out the excess water from the potato. This step is important as you do not want to have soggy tots. Add the other ingredients (minus the oil) to grated sweet potato in a mixing bowl and combine by hand. Preheat oil for frying in a large skillet over medium/high heat. It does not need to be enough oil for deep frying, but it should be enough to generously cover the bottom of the skillet. While to cooking oil heats, begin shaping your tots. Roll about a tablespoon (15g) of the dough into a ball, and then elongate it and flatten the ends to give it that distinctive tot shape. We’re you successfully able to use the tapioca flour/starch in the recipe? Also, has anyone baked them instead of frying them?